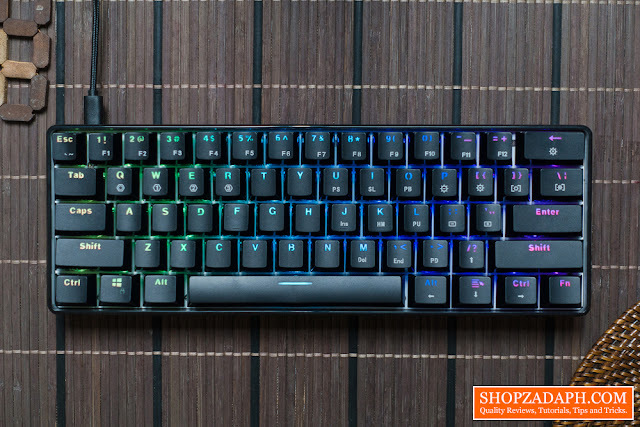 I've recently reviewed the Anne Pro 2 60% Mechanical Keyboard and while it is one of the best 60% keyboard out there, it is also quite expensive especially when you consider that there are a vast variety of budget 60% keyboards out in the market. Today, we are taking a look at a budget 60% keyboard that is around the usual 45-50 US dollar range but has a lot more feature to offer, the Geek GK61 Hot-swappable keyboard with optical switches. At first touch, this keyboard looks very nice and the look has a different character to it compared to most 60% keyboards out there, the layout is pretty standard using the ANSI layout, so replacing the keycaps on this keyboard is very easy, especially after you're able to memorize the layers and can get rid of the legends that would improve the overall look of the keyboard. With regards to the font used it is similar to the one we usually see on cheap custom keycaps but with additional legends for the layers. It has a decent weight to it of around 546g allowing it to be more portable, it also doesn't flex much thanks to its metal back plating partnered with the hard plastic housing. It also has a pretty slim bezel around it adding to the overall small form factor. Flipping it on its side we can see that it is slightly angled for a more ergonomic form factor with a kinda interesting glossy finish at the bottom, this keyboard uses the standard OEM profile but the default keycaps have this glossy finish on its side complimenting the glossy finish on the body. 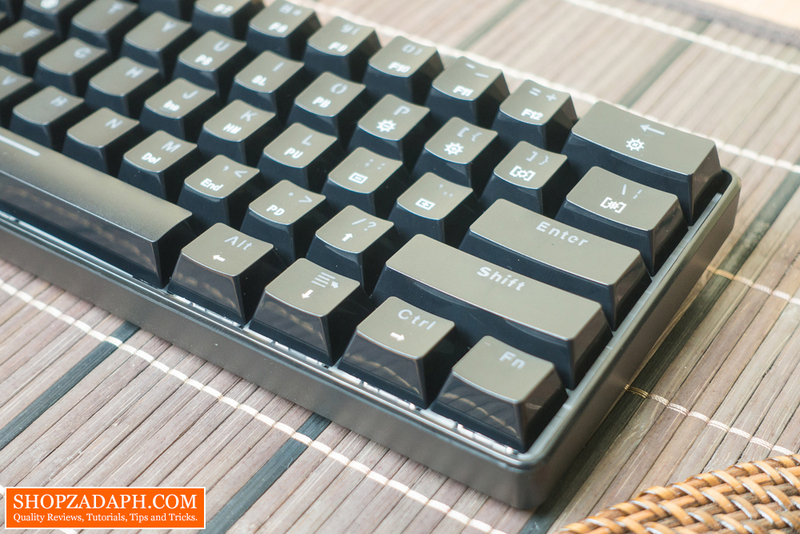 The glossy finish spans around the keycaps giving the keyboard a different character than we typically see. At the bottom, we have 4 rubber feet and the usual technical information like serial number, power ratings, certifications, and manufacturing location. 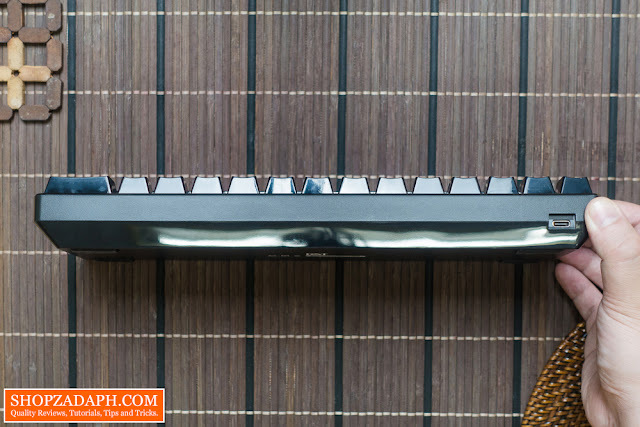 Looking closer, as you can see, it has a different visual vibe with the glossy finish, you just have to keep it clean to maintain its aesthetics. It looks cool when it's clean but I'm pretty sure this could easily become nasty in dusty and humid environments like what I have here in the studio. Now, In terms of the layout like I said it uses the ANSI standard, but since this is a 60% keyboard we lose the Numpad as well as the dedicated arrow keys, instead we have it on a different layer alongside the 9 special keys and the function keys up top. The function button is located at the lower right corner to toggle the different layers, I guess we'll just have to get used to using our pinky finger for this. 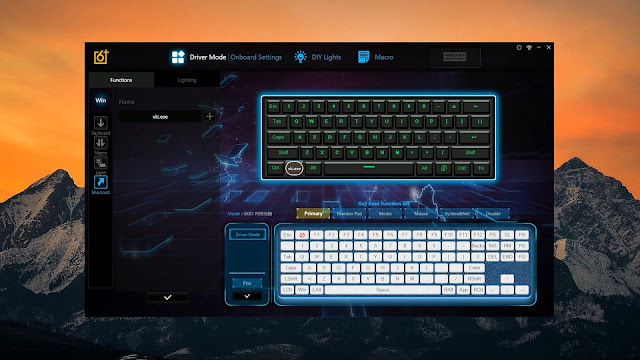 On the upper right side we have the lighting effects control keys, and then we have the 9 special keys also known as the nav cluster, and then the arrow keys at the lower right corner. All of these layers can be triggered by using the function key and I think it's a pretty decent location if you can train your pinky fingers to use it along with the layers. There's a ton of 60% keyboards out there and their implementation of layers and functions varies, but I think the GK61 has a pretty decent implementation right here. Here are some size comparisons for you guys. You can lower the brightness by pressing FN+P up until it blinks telling you that it's the maximum setting, you can also increase the brightness by pressing FN+left bracket. You can also adjust the speed of the animation by pressing FN+semi colon, and FN+apostrophe. You can turn off the LED illumination by pressing FN+backspace. Now, this keyboard actually has two sets of lighting modes, one is called the logic lights which are mostly dynamic effects and can be toggled by pressing FN+right bracket. The other mode is called code lights which are reactive that you can toggle by pressing FN+backward slash. This mode includes the audio sync that takes advantage of the built-in microphone, yes you read it right guys, this keyboard has a microphone. You can also toggle onboard settings by pressing FN+Q which is for online mode, we will talk more about that later, and then FN+W to R for the different preset layers that you can use in offline mode or when the keyboard is not using the software. 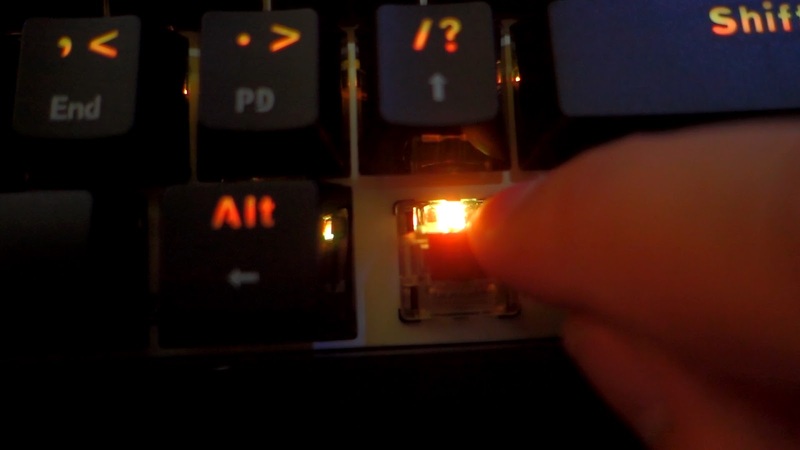 And lastly, of course, you can lock the windows key by pressing FN+windows key to prevent start menu from popping up while gaming. The Geek GK61 has true RGB lighting which means each LED is capable of up to 16.8m colors and the transition between animations is very smooth. 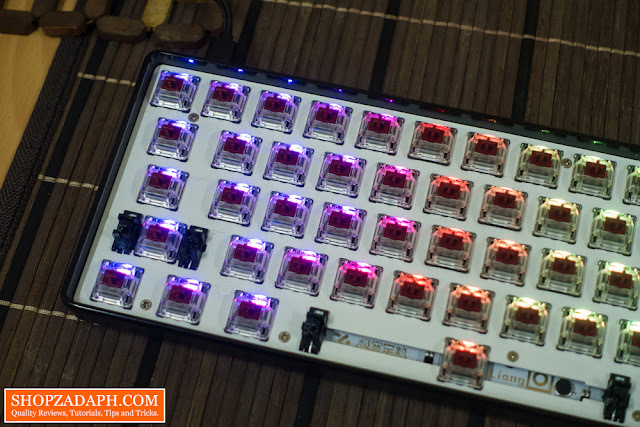 This keyboard uses SMD or surface mounted LEDs. Now, the switch itself has this little magnifying glass like material that magnifies the light and makes it even brighter, but it has one downside which we will discuss further later. 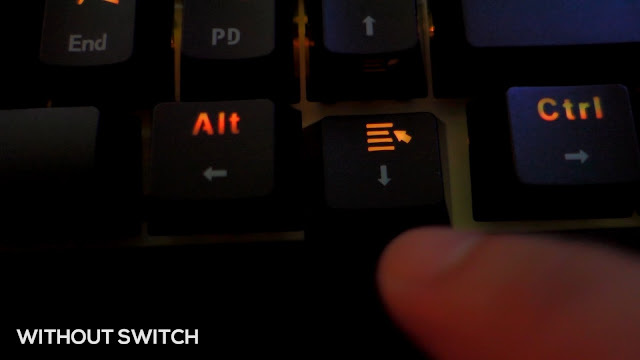 Now let's talk about the switch, which is one of the unique features of this keyboard. Under the hood, it has optical Gateron red which is basically the same as the normal Gateron red but with a different design. Gateron red has an actuation distance of 2.0mm, bottom out distance of 4.0mm and an actuation force of 45g. 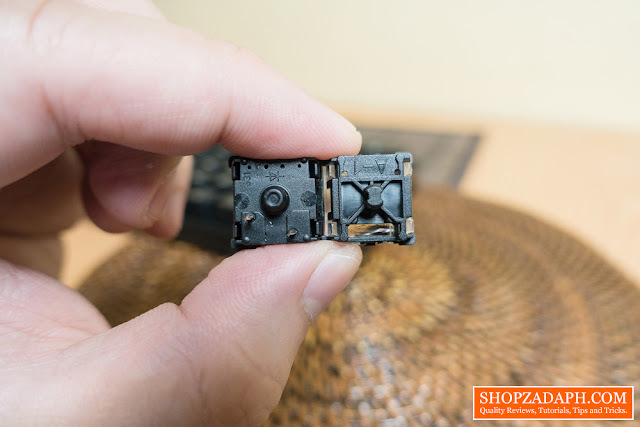 This being an optical switch, it doesn't have the usual metal prongs that connect to the PCB, instead, it has this shaft which is part of the stem that blocks the light in between the sensors on the PCB. 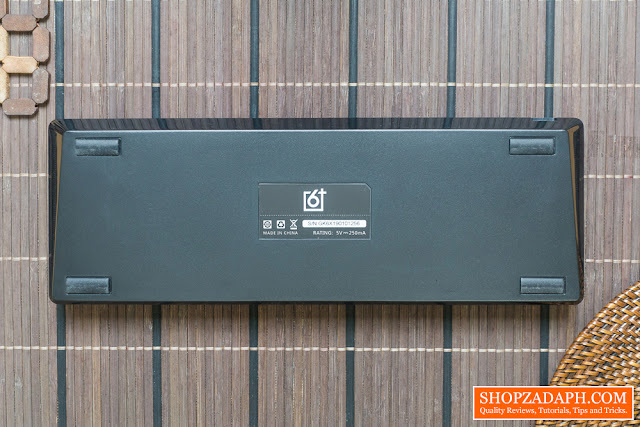 Now, the advantages of optical switch are it is known to have faster response times, better durability and easily replaceable due to the fact that it isn't soldered to the PCB. This keyboard is also IP68 waterproof, at least they claim it is, and the switch being optical could certainly help with that. Now when it comes to the actual feel of the optical Gateron red, it feels really smooth as expected with a Gateron switch, and since it only requires little force to actuate at 45g I think it is suitable for fast typist with touch typing skills, as long as you're pretty accurate with typing you can take advantage of this switch for faster productivity. It is also relatively silent due to its linear nature. 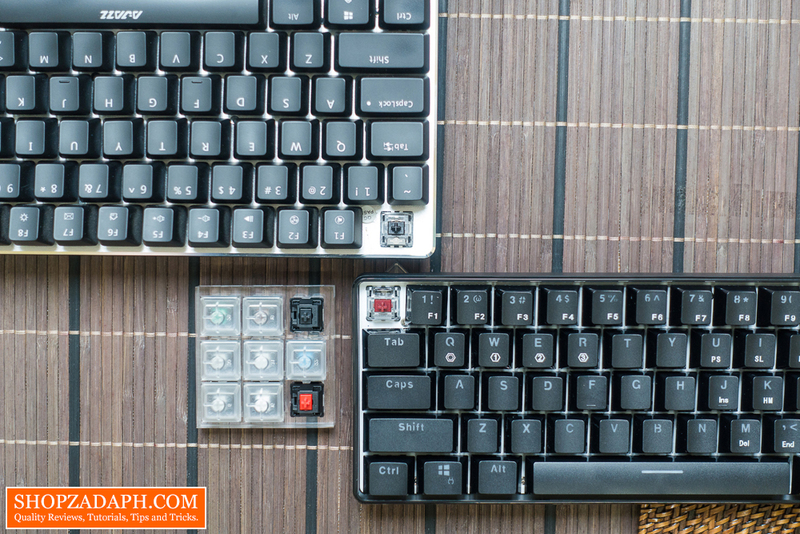 Here's a quick comparison between an optical Gateron red switch and the original Cherry MX red. 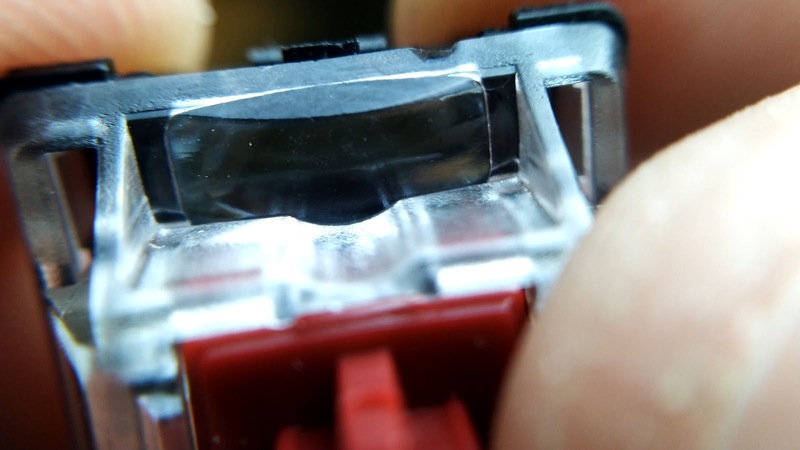 As you can see the Cherry MX has two metal prongs while the optical Gateron only has the center shaft. 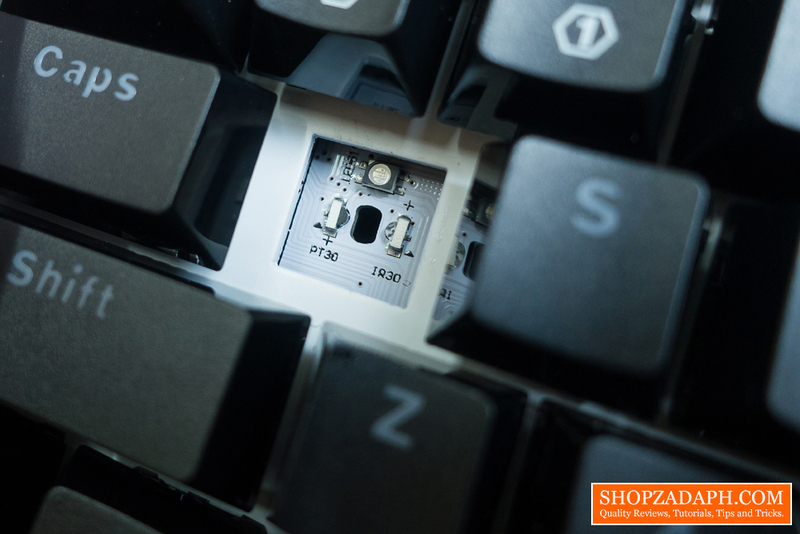 Now here are some downsides of the optical Gateron switch at least for this particular board. Since the switch is not soldered directly to the PCB it is noticeably wobbly. 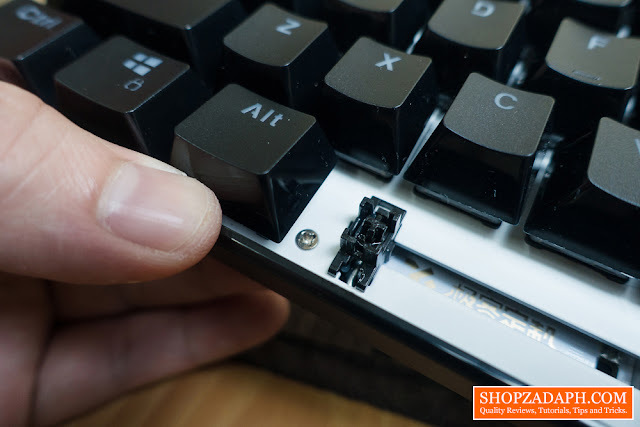 It is also very easy to remove and sometimes it comes off along with the keycap if the keycap is still a little bit tight out of the box. Now, If you've watched or read my previous keyboard reviews, you might have noticed that I love comparing switches, not only the ones I'm currently reviewing but on my other keyboards as well. So now we're going to compare the optical Gateron red with the Zorro black switch on my Ajazz AK33, and with the Cherry MX red and Cherry MX black. 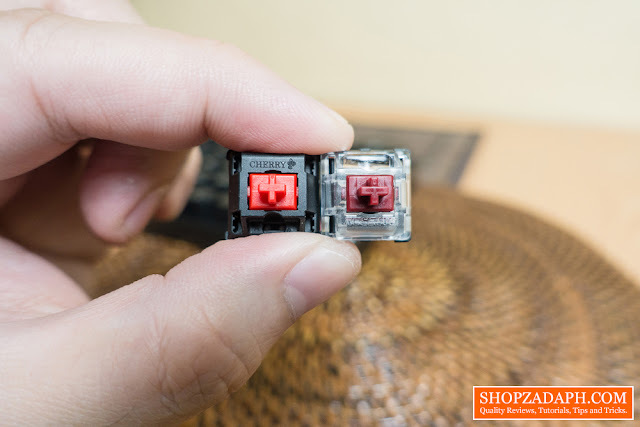 As per my testing, The optical Gateron red is lighter and significantly smoother than the Zorro black switch which is one of the more cheaper clones of the Cherry MX black. Now comparing the optical Gateron red to the Cherry MX red, they're basically the same in terms of the actuation force but since the optical Gateron red is smoother, it feels a tad lighter, at least for how I feel it. You will not notice the difference if you just quickly press the switch, you'll feel the difference when you press the switch lightly around the actuation point. 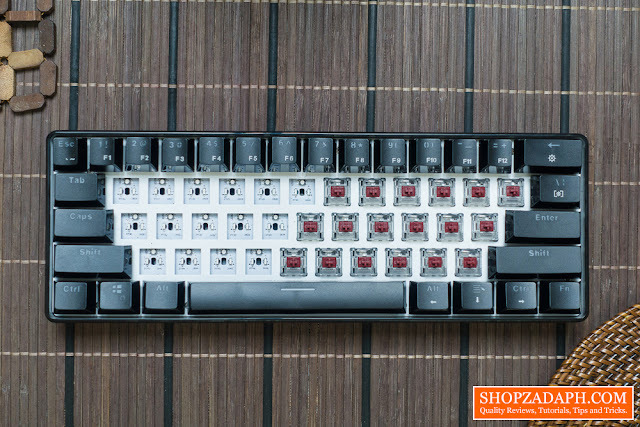 The same goes with the comparison between the optical Gateron red and Cherry MX black, the Gateron red is lighter and smoother. 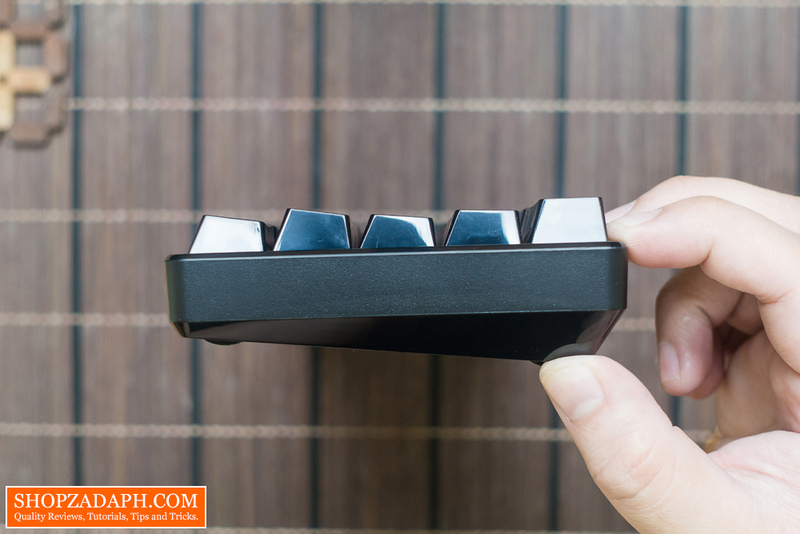 In terms of audible sound though when being pressed, the Cherry MX linear switches seems to be more silent. 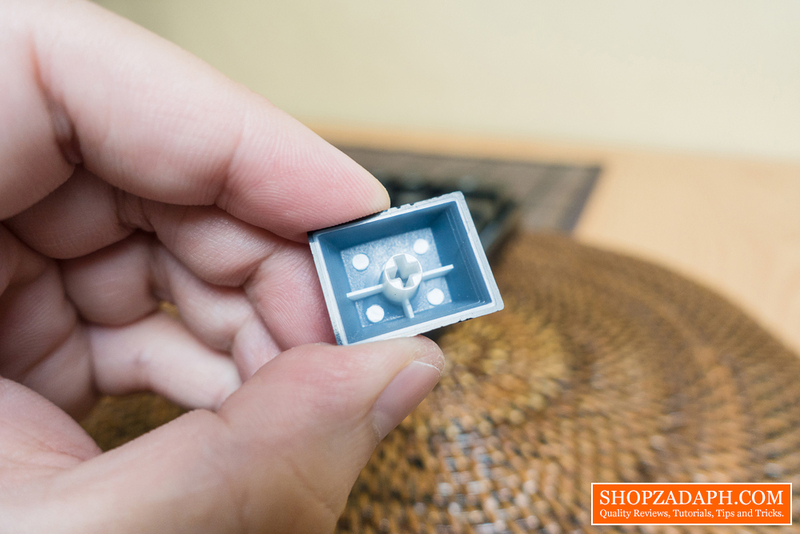 The keycaps are made of ABS plastic with two different texture, the top has the usual rough texture while the sides have this very shiny and glossy finish. It is double shot which means it has this translucent plastic underneath it for the legends and to allow the illumination to pass through. This will also allow the legends to not fade that easily over time. When it comes to the stabilizers, the GK61 has pretty decent ones, it's not the best but I've seen worse than this. It doesn't have much rattle even on the space bar. As I've mentioned earlier, this keyboard has a built-in microphone that can be used with the music sync either using the onboard code lights or with the help of the software. Now let's move on to the performance of this keyboard. 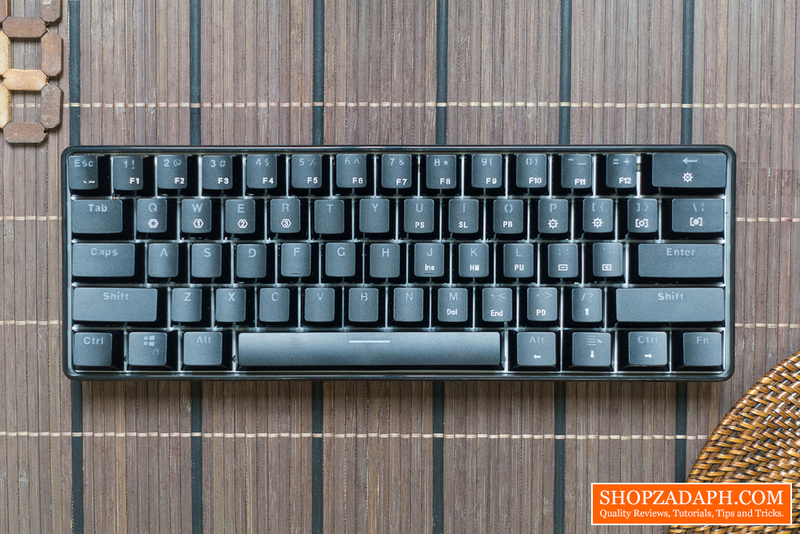 In terms of typing experience, the optical Gateron red is very light allowing you to easily actuate the keys, this is perfect for fast typist with touch typing skills. Personally, it is too light for my liking, I feel like I make mistakes more often with red than with a brown or black switch. 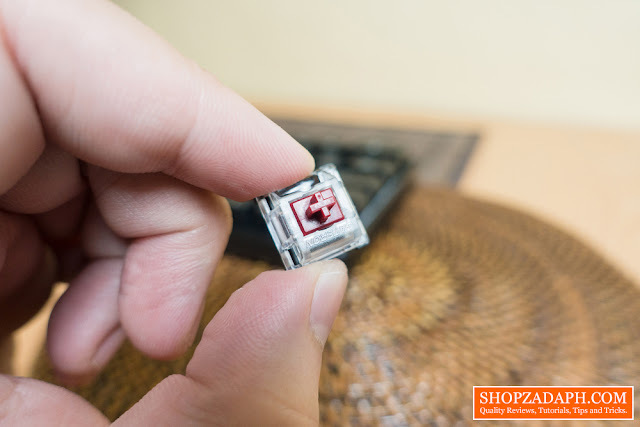 For comparison, the optical Gateron red only requires 45g of actuation force, 55g for optical Gateron brown and 60g for optical Gateron black. So if you're like me who isn't very good at typing, you may want to try a different switch first like black if you want linear, brown if you want tactile and blue if you want accurate typing with the help of the very audible click and tactile feedback. 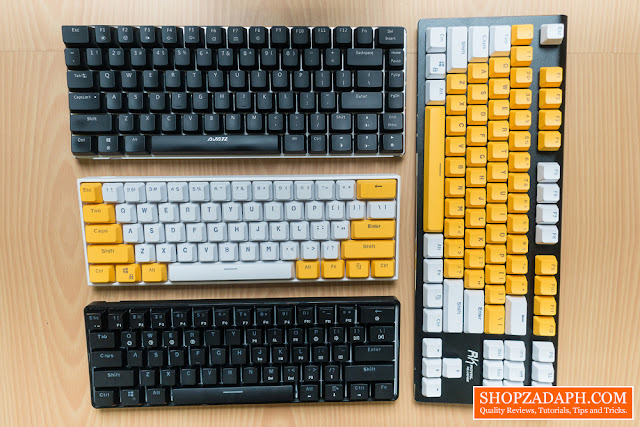 With regards to the keys being a little bit wobbly, I find that it is not that of a big deal when it comes to the overall typing experience, there might be a slight difference in feel compared to a keyboard with a normal switch but not so much that it takes away from the overall good experience. 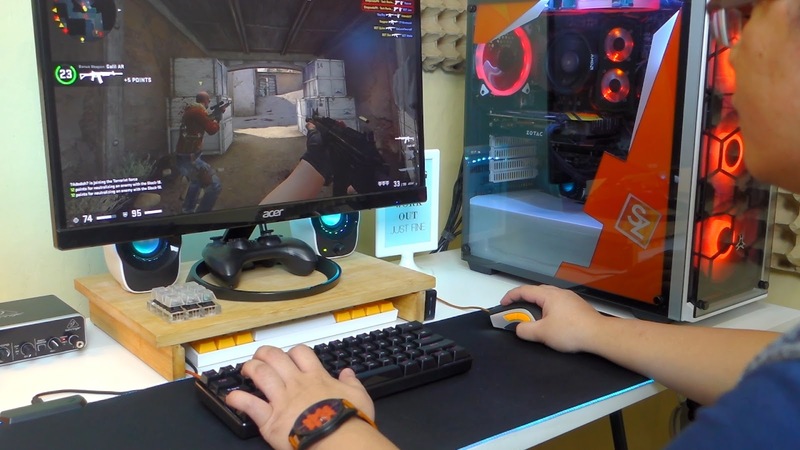 Now when it comes to gaming performance, I didn't find the light actuation force of the red switch as an issue, in fact, it is actually satisfying to use for gaming to easily actuate the keys for movements, changing weapons, reloading and the like. And since this keyboard only operates in a wired mode, you are assured that the NKRO or Nkey rollover is always working, this means you can press multiple keys at the same time without conflicts. Moving on to the software which I think is my least favorite part about this keyboard, it's a little bit confusing at first. 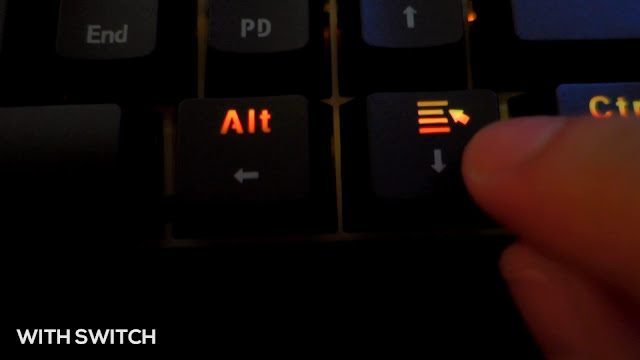 To be honest, I've seen better software from other similarly priced keyboards before, but if you're really into customizing your keyboard especially with the lighting effects, shortcuts, and macros, then you have to spend a little more time tinkering around this. But once you're able to figure out what you need, then you're all set. It's really confusing so I'll try to explain as best as I can right here. So we have two modes, the driver mode a.k.a online mode which gives you more customization including the ability to create a shortcut and launch things like applications and videos, which I think is pretty cool and can be useful in some cases. You'll also have more options in terms of the lighting effects, especially with the music sync feature. You can also sync the keyboard with the music using the built-in microphone but it will detect and react to everything including the background noise in your environment. Now we also have the onboard settings a.k.a offline mode, which will obviously take advantage of the onboard memory this keyboard has. 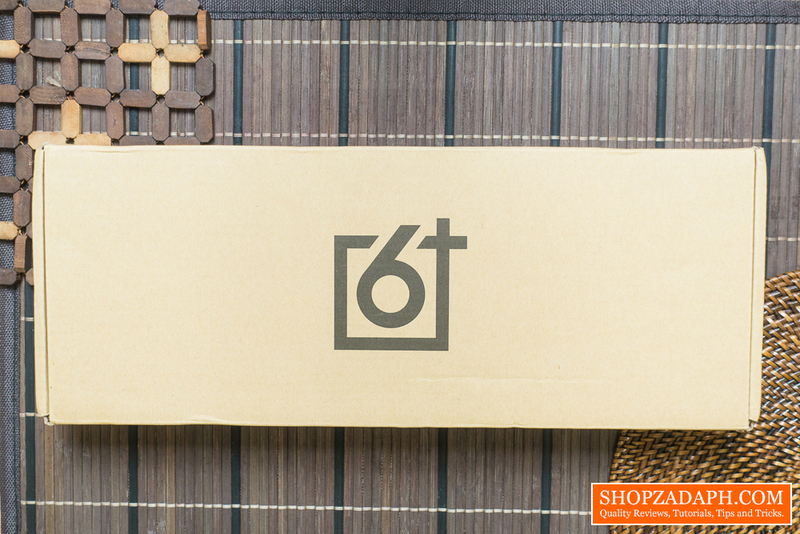 You'll still have all the basic customizations minus some perky ones such as the system music sync. 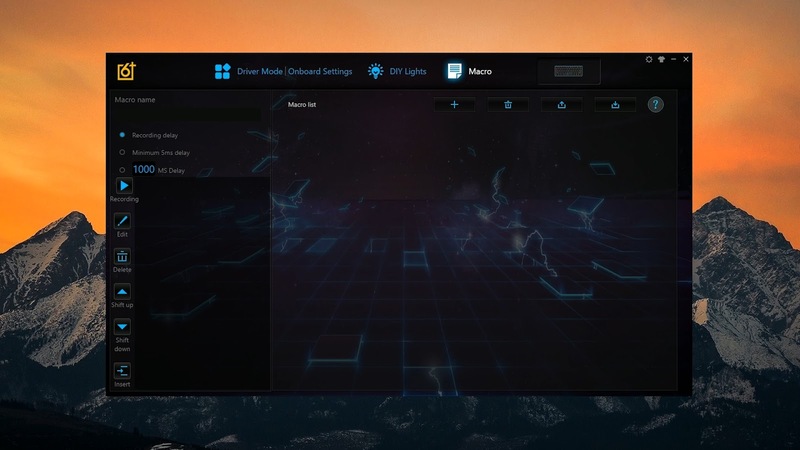 But you'll be able to toggle these settings even without the software like for example if you bring the keyboard along with you and connect it to a different computer. Aside from that you also have the option to record your own macros, but I figured it is also a little bit confusing so I didn't actually bother with this. Another thing is that you can actually create your own lighting effects and save it as a preset. I tried it for a while, I can not seem to figure it out so I didn't also bother with it too much. 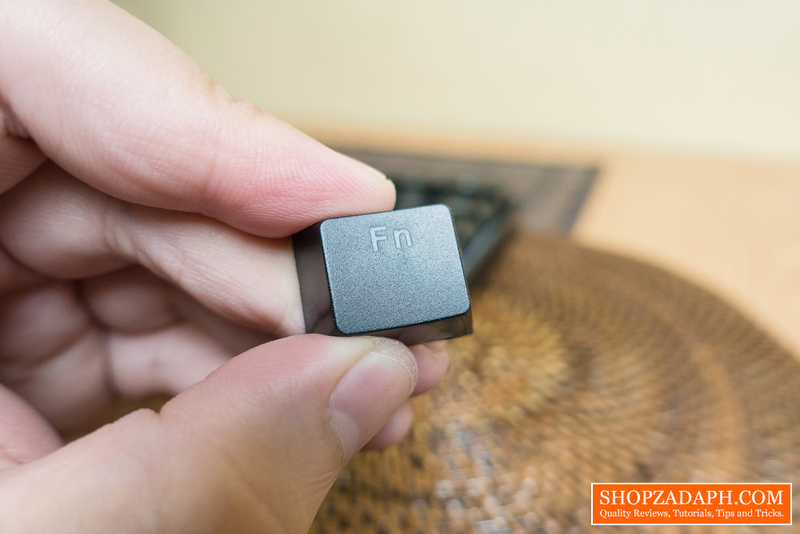 Other than that, you have the basic customizations like changing the function of a single key to another key, Numpad, media, mouse function, system functions and disabling the key. 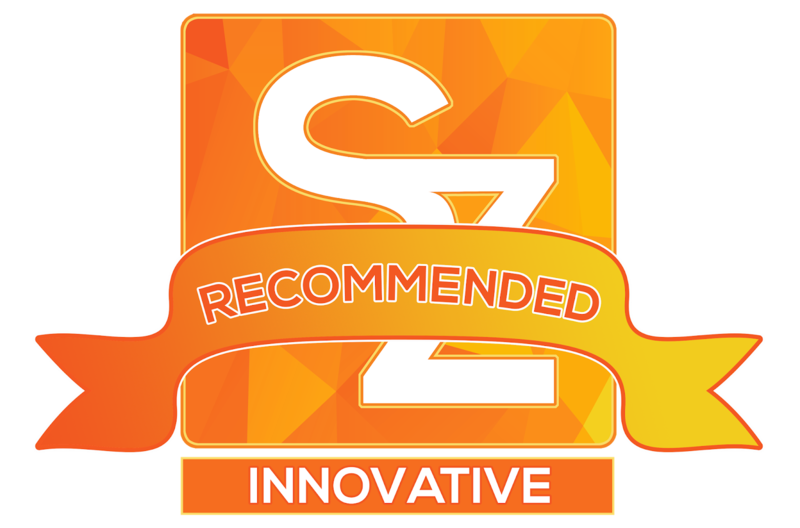 Overall, the software is still useful, providing that you are willing to allow some time to figure things out. And if all else fail, just reset the software to factory settings and just leave it as is. And lastly, before we end this review, I just noticed something odd with the LED illumination. 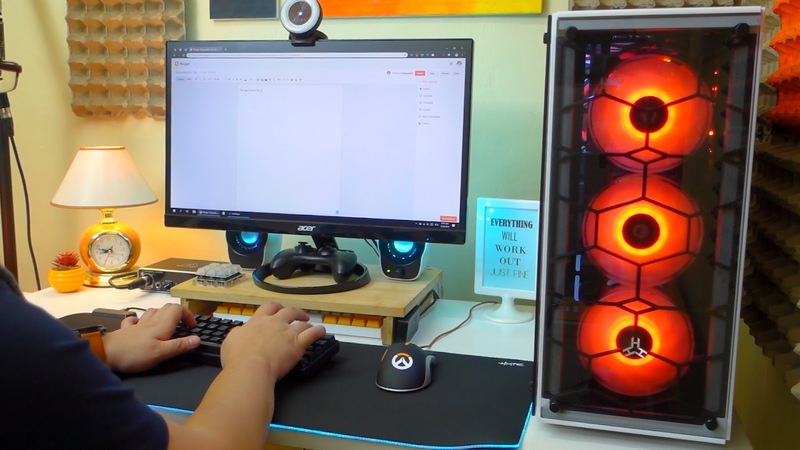 The RGB lighting on some colors has some gradient on it like for example for the color orange, it has a red and yellow gradient. After some close inspection, I found out that the reason is the "magnifying glass" on the optical Gateron switch. It somehow magnifies the color differently resulting in some gradient colors. Thankfully it only affects few colors in between primary colors, so red, blue, green, and other colors don't have this gradient effect. 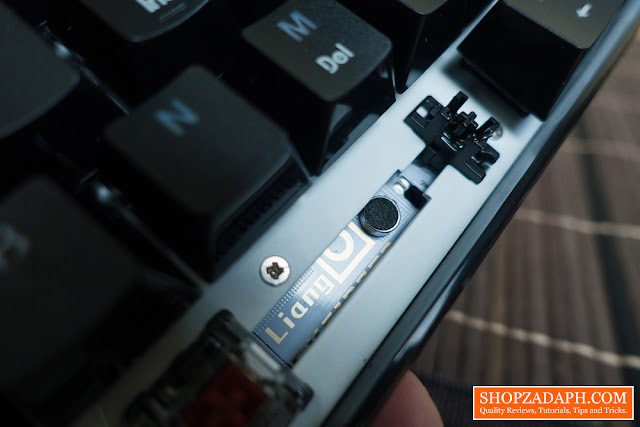 Alright guys, so it may seem a handful understanding everything I said in this review but to conclude, If you're looking for a decent budget hot-swappable keyboard that has an optical switch, then this is a very good option. The build quality is decent, the design with the glossy sides is subject for personal preference, but I think it looks cool when it's clean. 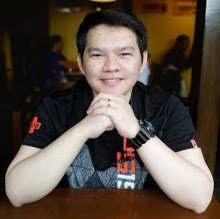 The layout is standard and the layer implementation is functional and can be learned in a short period of time. 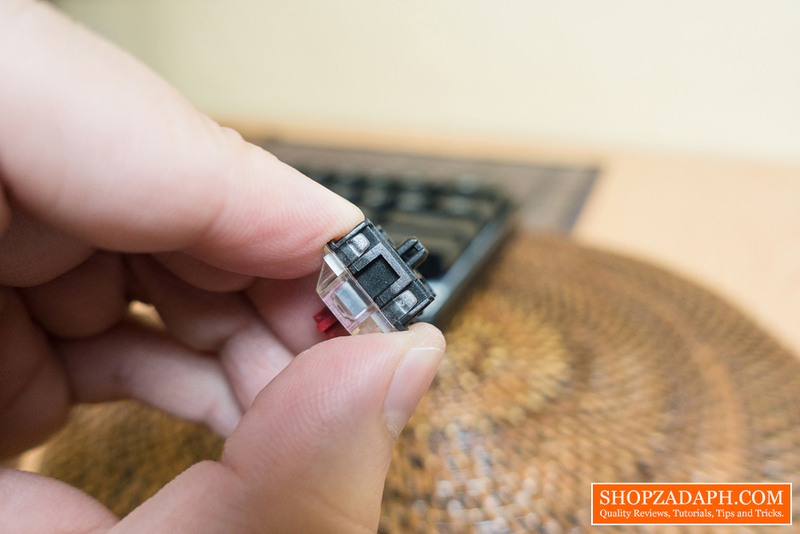 The optical Gateron switch is very smooth and satisfying, you just have to pick the right color for your preference since it is available in blue, brown and the red switch that we have right here. The only downside that I don't like about this keyboard is the software, I think it is not very intuitive and it requires more time to get the hang of. But if you don't rely on software, then you're all set. Anne Pro 2 60% Mechanical Keyboard Review - Gateron Brown! Thanks to Banggood for making this review possible, you can get this keyboard from their official website, link below.